Looks pretty good to me @mikerezny, great job. Its quite therapeutic isnt it. So long as the yeast is fresh, the bread will rise eventually regardless of the ambient temperature. Warmth will just speed it up. Keeping the outside a little moist to stop a skin forming. Ambient temp is always going to be a bigger issue in the bush than it is at home, and if its a bit coolish Ill put it in the vans sink on the rack, put boiled water in the bottom of the sink and a towel over it all to seal it up. You may have to be inventive to prop the towel up like a tent so it stays clear of the rising bread. tried out your recipe for bread. Worked quite well. Liked your idea about putting the dough in the car to rise. It only got up to 17C during the day at Kirth Kiln. Let the bread rise for over an hour. Made only a half recipe, and made four bread rolls. Really happy with result and they tasted great. Would like to get them to rise higher. Any suggestions?We cannot get enough heat into the cast iron pan with a stainless steel lid. So we cheat. Cooked for 10 minutes, turn around 180 degrees to ensure even cooking, then flipped over for 10 minutes to brown the top. Pan started off at about 250C, but cools down quite a lot when cooking. another first for the Chippy: Pita bread. It was impossible to get the dough to rise as much as I wanted since the max temperature all day was 9C. They still cooked ok. 2 out of 6 we cooked did the full balloon. They tasted great, so we will be doing them again for sure. 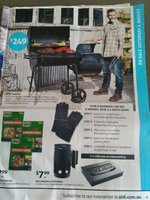 Hey @mikerezny , Aldi have the chip burners for about $8 next week. Thanks for that. I will be off to stock up. My one is now about 18 months old and , although showing some wear, is still going strong. I will probably get anther couple of years out of it. But a spare one or two can't hurt! There are times when it would even be good to have two of them on the go! Over 30 dampers baked on it now as well as 4 breads. Not tempted to pick one up for yourself? It would be nice to have someone else using one to make interesting things. Where have you seen that @Drover , I have all their brochures from a couple of weeks back to the latest and I can’t find it mentioned. What date are they on sale? Binned mine but it's about 2 weeks away I think, we get them very early here., probably because the damn shop is like 60kms away. I'll see if its still in the bin. Ours arrived today. We are a bit behind the times down in our little corner of the world. got the Aldi chippy today. Same make as the one from Bunnings. A few differences. Galvanised as against Black. And a few less holes which I think may actually be better. So I now have two spares and the original is still going strong.